Amitabhavyuha Sutra (Skt. Amitābhavyūhasūtra), which is also known as the longer Sukhavativyuha Sutra (Skt. 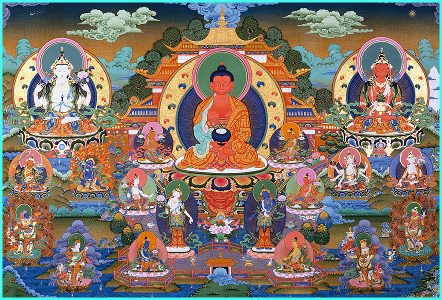 Sukhāvatīvyūhasūtra), gives a detailed description of the Sukhavati pure realm of Buddha Amitabha. The teaching takes place on Vulture's Peak Mountain near Rajagriha. It was translated into Tibetan from Sanskrit by Shyang Yeshé Dé. This page was last edited on 25 October 2010, at 16:15.